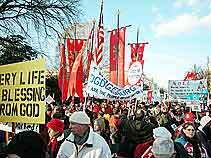 The American TFP joined well over 100,000 concerned Americans from across the country for the annual March for Life in Washington, D.C. 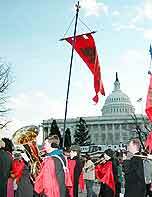 The American Society for the Defense of Tradition, Family and Property (TFP) joined well over 100,000 concerned Americans from across the country for the annual March for Life in Washington D.C. This year’s January 22 march marked 31 years since the infamous Roe v. Wade decision granting women the “right” to murder their preborn children. Dozens of TFP activists handed out thousands of flyers, carrying an American flag and eight 18-foot standards, TFP symbols, which have been a fixture at each march since its inception in 1973. This year’s flyer, titled “Making Abortion Unthinkable,” (click here to read “Making Abortion Unthinkable”) showed that being anti-abortion means being pro-family and pro-marriage. It decried the homosexual agenda which strives to undermine the family by redefining marriage to include partnerships other than those between one man and one woman. Fr. Kevin Beaton of Newcastle and His Imperial and Royal Highness, Prince Bertrand marched with this year’s TFP contingent and distributed flyers. Fr. Kevin Beaton of Newcastle, Penn. traveled to the American TFP headquarters where he celebrated Holy Mass in the traditional Maronite Rite before marching with the TFP in Washington. In addition to President Bush, several congressmen addressed the crowd, including: Sen. Sam Brownback (R.-Kans. ), and Reps. Christopher H. Smith (R.-N.J.), W. Todd Akin (R-Mo. ), Todd Tiahart (R.-Kans. ), Steve Chabot (R.-N.Y.), Jim Ryun (R.-Kans. ), Melissa Hart (R.-Penn. ), Mike Pence (R.-Ind. ), Ron Lewis (R.-N.Y.), Roscoe Bartlett (R.-Md. ), Rick Renzi (R.-Ariz.), Steve King (R.-Iowa), Thaddeus G. McCotter (R.-Mich.), Michael C. Burgess (R.-Tex.) and Patrick J. Toomey (R.-Penn.). Gazing at the shivering ocean of marchers it was apparent that attendees were unmoved in their resolve to continue struggling against abortion. Adding more life to the event, the TFP marching band played the Marine’s Hymn and other patriotic songs on trumpets, bagpipes, fifes and drums. Gazing at the shivering ocean of marchers it was apparent that attendees were unmoved in their resolve to continue struggling against abortion. They were gathered in defense of an ideal and firmly convinced to follow their consciences. 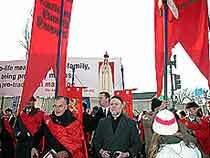 This entry was posted in In Defense of the Unborn and tagged 2004, abortion, American Society for the Defense of Tradition, Blessed Mother, cape, Christopher H. Smith, Droit de Naitre, Family and Property, Fr. 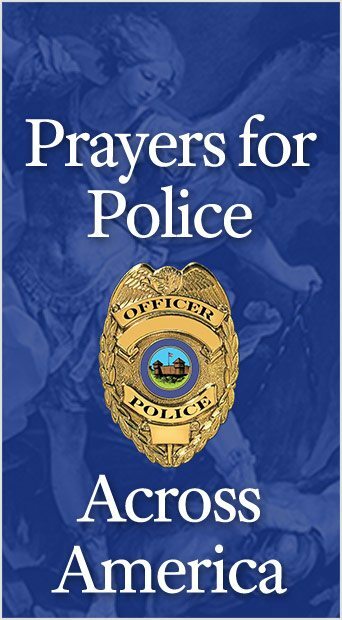 Kevin Beaton, Jim Ryun, March for Life, Marine's Hymn, Mary Most Holy, Melissa hart, Michael C. Burgess, Mike Pence, Patrick J. Toomey, Prince Bertrand of Orleans-Braganza, pro-marriage, Reign of Mary, Rick Renzi, Roberto Bertonha, Roe v. Wade, Ron Lweis, Rosco Bartlett, Sen. Sam Brownback, standard, Steve Chabot, Steve King, Thaddeus G. McCotter, Todd Tiahart, W. Tdd Akin, Washington by TFP.org. Bookmark the permalink.